Why are we so insistent that women and men are different? This introduction to gender provides a fascinating, readable exploration of how society divides people into feminine women and masculine men. Gender and Everyday Life explores gender as a way of seeing women and men as not just biological organisms, but as people shaped by their everyday social world. 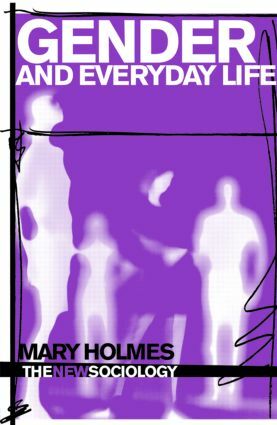 Examining how gender has been understood and lived in the past; and how it is understood and done differently by different cultures and groups within cultures; Mary Holmes considers the strengths and limitations of different ways of thinking and learning to ‘do’ gender. Key sociological and feminist ideas about gender are covered from Christine Pisan to Mary Wollstonecraft; and from symbolic interactionism to second wave feminism through to the work of Judith Butler. Gender and Everyday Life illustrates gender with a range of familiar and contemporary examples: everything from nineteenth century fashions in China and Britain, to discussions of what Barbie can tell us about gender in America, to the lives of working women in Japan. This book will be of great use and interest to students to gender studies, sociology and feminist theory.